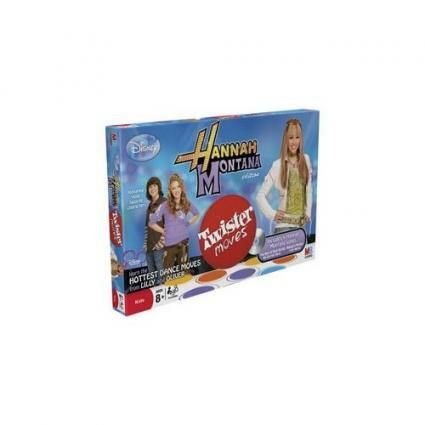 Hannah Montana Twister Moves combine Dance Dance Revolution-style gameplay with the fun and challenge of Twister. You will actually play Twister as moves are called out, which resemble dance steps and movements. Don't worry if you think the Twister portion of the gameplay was lost, it wasn't. The game is for one or two players ages 8 and up. A CD player is needed to play the CDs and does not come with the game. The original voices of Lily and Oliver call out the dance moves (which can include your hands or your feet), and you are to follow along. Some movies will have you spinning, twisting, and simply dancing. For example, Lily may call out "Purple, left foot" and you must put your left foot on the purple circle. The instructions they call out may come one after the other, so it may take a few times listening to the song and practicing the moves in order to learn them. Only four Hannah Montana songs come with the game. Her name is on the game; there should be more of her songs included. The dance tracks are upbeat, peppy, and fun to dance to, but most girls or parents are buying it because of the Hannah Montana appeal. A CD player is needed. Most people have relinquished a boombox and now play cds on a computer or a stereo system, which could be taken up by little brothers or unknowing fathers. If you want your daughter or Hannah Montana Twister player to enjoy this game, you may need to invest in a cheap CD player, which you can probably find at Target or Walmart for about $20. The rules are easy, but you won't be rocking out immediately. Each three or four minute song has a number of moves that are called out, and some are back-to-back. The flow of the game can sometimes get stagnant as players pause and figure out where the circles are and how to move in order to complete Lily's or Oliver's command. It's Hannah Montana! Sure there are only four songs on the Hannah Montana cd, but you can be directed on the Twister mats by Lily's and Oliver's voices. The real actors voice the commands, so it's like being on the show, right? The cost is decent. If you're in hurry to purchase the game, you can find it at most retailers for around $25. If you can wait a few days, then research some online stores like Amazon or Overstock to find better prices. The game is still relatively new, so you should be able to find it at most brick-and-mortar stores. But, as the game starts to lose steam and retailers begin moving their inventory of this game out, your source for finding this game may be online. Amazon can probably offer you the best deals. Whether through the Amazon marketplace or through their own channels, you might be able to save half the cost and sometimes even more. Hasbro Toy Shop can offer you more guarantees of being in-stock, but you will most likely pay a little more. eToys also has good discounts, but they don't have the same channels as Amazon has in order to give you the best deals around.